WTI crude prices are in the $50.50-$50.75/b range this morning after a sharp drop yesterday. WTI opened at $50.63/b today, a significant decrease of $1.73, or 3.3%, below yesterday’s opening price. Current prices are $50.59/b, $0.15 above Wednesday’s close. OPEC was quick to emphasize that consensus was building on the extension of the production cut agreement, which helped to halt the price decline. Product prices also dropped sharply yesterday, and, like crude, the price drop appears to have levelled overnight and in early morning trading. Diesel opened at $1.583/gallon in today’s session. This was a drop of 3.89 cents (2.4%) below yesterday’s opening price. Current prices are $1.5852/gallon, up by 0.39 cents from yesterday’s closing price. Gasoline opened at $1.662/gallon today, a large drop of 3.96 cents, or 2.33%, from yesterday’s opening. Prices are $1.6704/gallon currently, up by 1.14 cents from yesterday’s close. The matter of stockpiles is once again at the forefront. 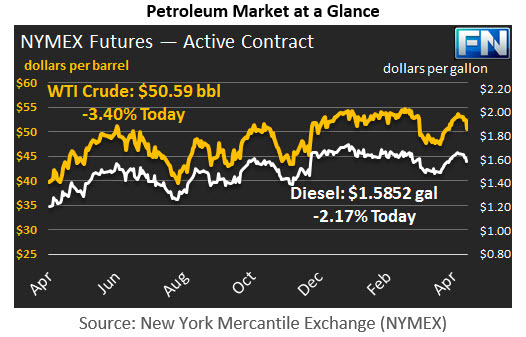 On Monday, the market had anticipated across-the-board draws on crude, gasoline and diesel inventories. 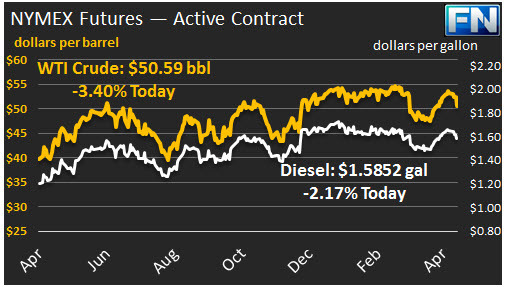 The API data on Tuesday fell short of expectations, showing a smaller-than-expected crude stock draw of 0.8 mmbbls, plus a gasoline stock build of 1.4 mmbbls instead of a draw. Diesel stocks were seen falling 1.8 mmbbls. Gasoline prices were weighed down by the prospect of a build. The EIA data released later was reasonably close to the API estimates, reporting a crude stock draw of 1.034 mmbbls, a diesel stock draw of 1.955 mmbbls, and a gasoline stock build of 1.542 mmbbls. There have been only three weeks this year with crude stock draws. Therefore, the numbers should have been constructive for crude prices. The fact that they were not suggests two things. First, that market technicals pointed to a sale, and second, that the gasoline inventory build and apparent drop in gasoline demand has prompted selling. Because we believe that gasoline has played a key role in the price drop, our second article today dives more deeply into the recent softening of the U.S. gasoline balance.